WELCOME TO THE HOME OF TRUCK COMPANY 1. Truck 1 is stationed at Fire Headquarters. Its the busiest Truck in the city and is the first Truck to be fully staffed with 4 personnel under the Chief's re-organization plan. (3 firefighters and 1 officer.) The Truck covers the Downtown and Janesville sections of the city and is also first due to the Millyard. Except the small Southeast area, the Truck is second due to all the rest of the city. Truck 1 also responds second due citywide to all auto extrications. Truck Company 1's staffing meets national Standards. This was assigned to "Ladder 1"
Truck 1's former rig is a 2001 91' Bronto Skylift with an E-One cab. The boom is an articulating platform style with 2 booms, a "jib arm" and a rotating bucket. These features allow us to reach numerous windows quickly, get under soffits and roof overhangs, get up and over other buildings, square up to rooflines for easier roof operations, go below grade, etc. Having these features makes us very versatile on the fireground with the ability to perform our functions quickly and efficiently usually from inside the bucket. It is currently in reserve status at Station 4. Former Truck 1 at Greenwood Fire Apparatus in Mass before being delivered to Manchester in 2001. By the year 1839 the population of the town of Manchester was nearing 6,000. A building boom was underway as a result of land sales near the Merrimack River by the Amoskeag Manufacturing Company, the major employer. A town meeting took place on October 26, 1839, and the voters adopted fire protection measures. They appointed eleven Firewards with Amory Warren as chairman and Walter French as chief along with the appropriation of $1000.00. A Hunneman hand tub was purchased for $631.25, housed in a new station, built for $90.00, and located on Vine Street. 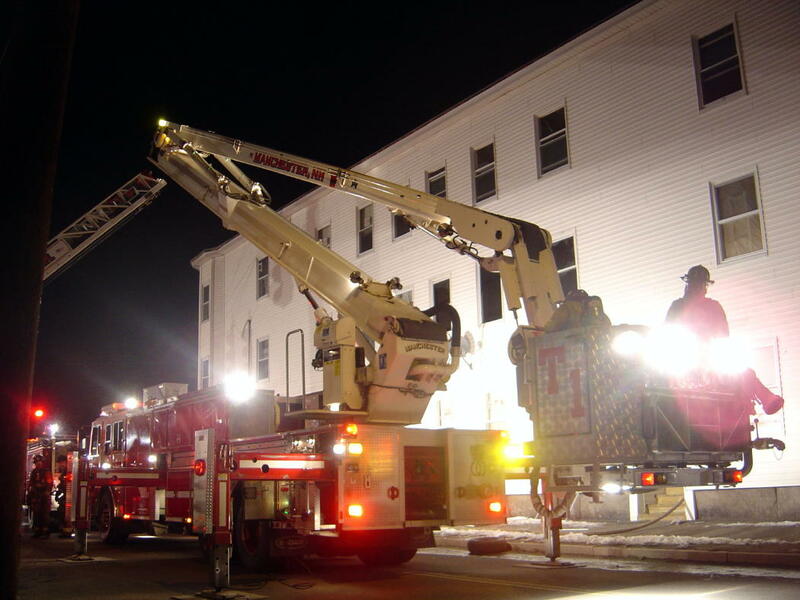 On April 12, 1841, the first hook and ladder company was organized. The carriage at the time consisted of four heavy wheels, attached by two strong timbers with arms on each side to prevent the hook and hand ladders from falling. Ladders longer than the truck carried were made up by lashing several together. From 1844 to 1852 the company consisted of 45 volunteers who served without compensation. Upon receiving a modern replacement truck in 1872 the company adopted the name "Excelsior". By the end of 1860, the Fire Department consisted of three hand engines, three steam fire engines and one hook and ladder company. The reorganization in 1862 shows the department with three steam engine companies of fourteen men each, one hose company of thirty men and one ladder company of twenty-five men. The force available to fight fire was 97 men. Prior to July 1923 firefighters worked 96 hours on duty followed by 24 hours off, averaging 134.4 hours per week. On July 1, 1923, the schedule was changed to 72 hours on duty followed by 24 hours off, an average of 126 hours per week. Members were allowed to leave the city on their days off, but had to respond to alarms during meal hours. Beginning in 1932, the Department began to feel the effects of the great depression. On December 17, 1931, the work hours were reduced to 112 hours per week with a 10 percent cut in pay. On August 8, 1932, the members returned to 126 hours per week. In March 1938, the member's hours were permanently reduced to 112 hours per week. Pay for sick leave was discontinued unless the fireman was injured in the "service". The war years did not leave the department completely unaffected. Beginning December 10, 1941, flags were flown every day. December 11, 1941, it was ordered that all off duty and call firefighters had to report for duty on air raid signals and over the next years several were received. Beginning May 4, 1942, the companies began a night watch, which was discontinued December 6, 1943. Other potential problems must have been anticipated as the companies were supplied with riot guns and cartridges until October 20, 1944. On March 9, 1943, the companies were issued non-combatant gas masks and further air raid orders. Several of the call men left to join the war effort. Local # 856 of the International Association of Firefighters was organized to represent the city firefighters on April 4, 1946. On June 1, 1946, the members began working 72 hours per week on a day-night shift system. By 1952 the schedule was again reduced to 48 hours and 52 firefighters were hired. This organization represents all members of the department up to the rank of district chief. May 17, 1965 saw the city's newly purchased snorkel truck, the first such apparatus in New Hampshire, put into service. Truck 1 was purchased for $56,300. It soon received a fair trial when shortly after 3 A.M. on December 2, 1965; a two-alarm fire destroyed the roller skating rink at the once popular Pine Island Amusement Park in the Goffes Falls section of the city. Previous fires had destroyed the dance hall and the arcade area of the park. In September, 1978 frustration with the lack of progress in negotiating a labor agreement, Manchester Professional Firefighters Association - Local #856 voted to strike. Governor Thompson ordered National Guardsmen to augment the Manchester CETA, probationary members and deputy chiefs for two weeks. Finally a negotiated reduction of work hours and improvement in wages ended the strike. 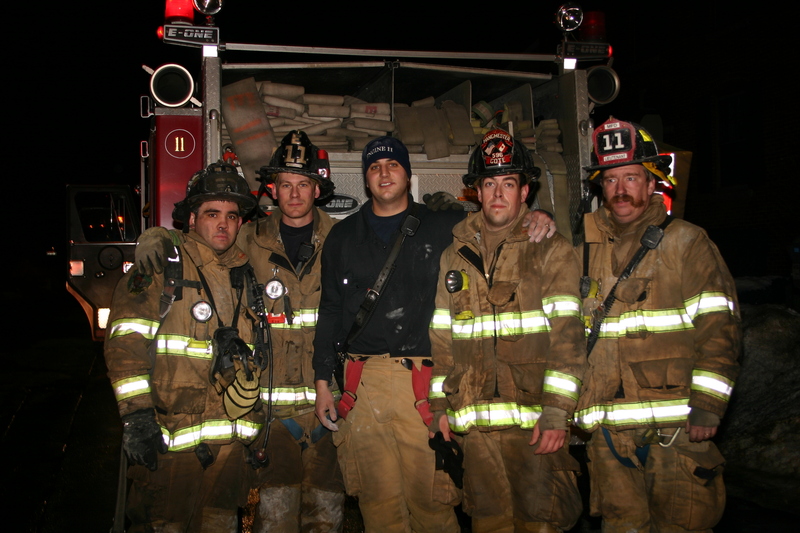 Firefighters contracted work hour reductions over the following years utilizing “O’Malley Days” in their work schedule. On January 1, 1984 a 42 hour week, 4-group, 2- platoon system was instituted for line firefighters. The platoon hours remained the same, 10-hour days and 14-hour nights.